Rene Steinke is fascinated by how much glass has changed the world, from telescopes and microscopes to Intel chips. 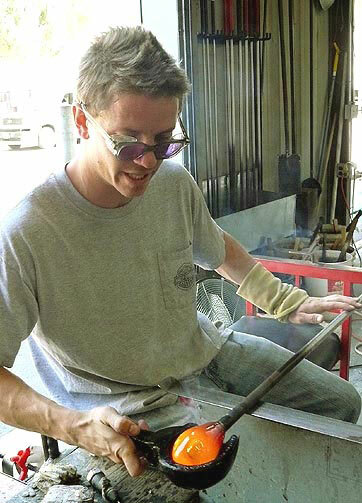 Steinke, a self-described 30-year-old child, spends his days teaching classes at Rainbow Glass and working in his dream factory in downtown Sacramento, Calif. (it’s half glass blowing studio, half skateboarding rink). Growing up, Steinke worked at a pizzeria, where he burned himself more on the pizza oven than he does now on balls of molten glass. But pursuing his passion comes at a cost: his financial struggles force him to build all his equipment from junkyard scraps. How did you transition from remodeling roofs to blowing glass? At age 15, someone at the construction site I was working at offered me an opportunity to help out at a glass blowing studio after work. The studio’s owners noticed I picked up [glass blowing] quickly and wasn’t afraid, and they offered me a job on the spot. I quit my construction job and started working there instead. This multi-colored vessel features a large hand-blown marble in the center. 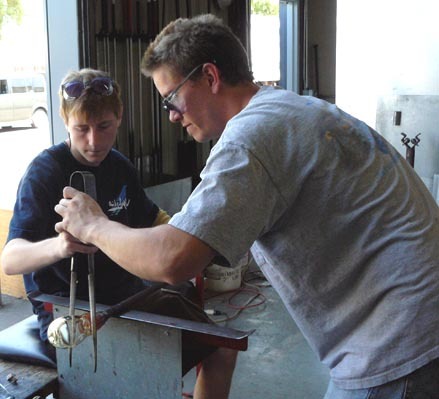 Without a formal education, what sort of training did you receive for blowing glass? I studied at the Corning Center for the Fine Arts in Corning, NY, under a famous Venetian glass blower. That opened my eyes to how glass blowing works. Briefly explain the process of glass blowing. A ceramic crucible inside the 70-lb. kiln heats up to 2100 degrees Fahrenheit, melting the glass inside it. I take a steel pipe – a hollow blowpipe – and gather a ball of molten glass on the end. I blow into the pipe to shape the glass, let it cool, and dip it back into the furnace. Then I break the glass off the blowpipe and leave it in the oven to cool until the end of the day. Do you coax the glass into certain shapes only using your breath? With the help of metal tools, like tweezers, and cherry wood blocks. How close can you get to the glass without burning yourself? You never actually touch the glass, but you can use wet newspaper to shape it. Working on a large piece might require someone else to hold up a paddle or piece of wood as a heat shield. Steinke teaches student Gabriel Dart, 15, how to start the shape of a piece. Most kids grow out of the pyro phase. I’ve always done extreme activities, like skateboarding and snowboarding – and I’ve always loved art. So I found this extreme art form, where I had an instant love for the process and the medium. I have bad ADD [attention deficit disorder], and this is the only thing that makes me focus. Do you still find time to skate and snowboard? I have a warehouse in downtown Sacramento with a half-pipe and a glass blowing studio. Best part of the job: Making something beautiful without touching it with your hands. Most challenging part of the job: It’s very physically demanding work and difficult to learn. You keep stumbling over yourself until you figure it out, but that’s why I enjoy it so much. It must be tough to keep the hot glass intact. If you let a piece go below 1,000 degrees, you risk breaking what you’re working on. The glass is moving all the time; you’re constantly chasing this weird, morphing piece, trying to control something that doesn’t want to be controlled. Any serious injuries? Only cuts from the glass, not burns. When I worked at a pizzeria, I burnt myself more on the damn pizza oven than I have ever burned myself on glass. And now, I’m working with three to four times the amount of heat. 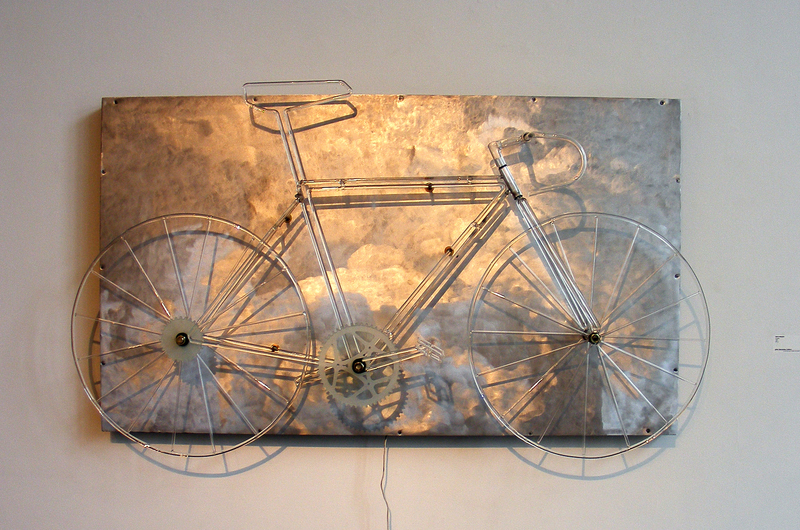 Steinke created this glass bicycle for the annual Amgen Tour of California. It features working parts, complete with rolling wheels. How would you describe your style? I’m really into using nature, particularly sea life. I’m working on a product line of functional sea life art that’s half sculpted and half blown, like seahorse flower vases. Your favorite project: I was the lead glass blower for a project in the Davis Public Library in Davis, Calif., which consisted of 32 pieces of glass suspended from the skylight in a reverse pyramid. Common myths about the profession: People ask whether sucking inward will burn my lungs out. The answer: no, it won’t. Biggest setback: Figuring out how to make money and survive. But I overcame that by scrounging – I built all my equipment from junkyard pieces. If I see metal in an alley, I’ll pull over and pick it up. Pricing for your work: They range for $50 to $10,000, based on the time it took me, amount of glass used, and how much I love the piece. If you could be reincarnated into someone dead or alive, who would it be? Let’s go with Tony Hawk. Interested in blowing glass? Rene Steinke offers some advice. 1. Remember that you fail your way to success. 2. Attend a reputable training program. Two schools that offer great ones are the Corning Center for the Fine Arts and the Pilchuck Glass School. 3. Travel abroad and learn from as many mentors as you can. There are a million ways to blow glass – don’t get stuck in just one. PLUS: For more artsy No Joe Schmos, check out the tattoo artist, the filmmaker and film editor couple, and the permanent makeup artist. All photos courtesy of Darby Patterson. 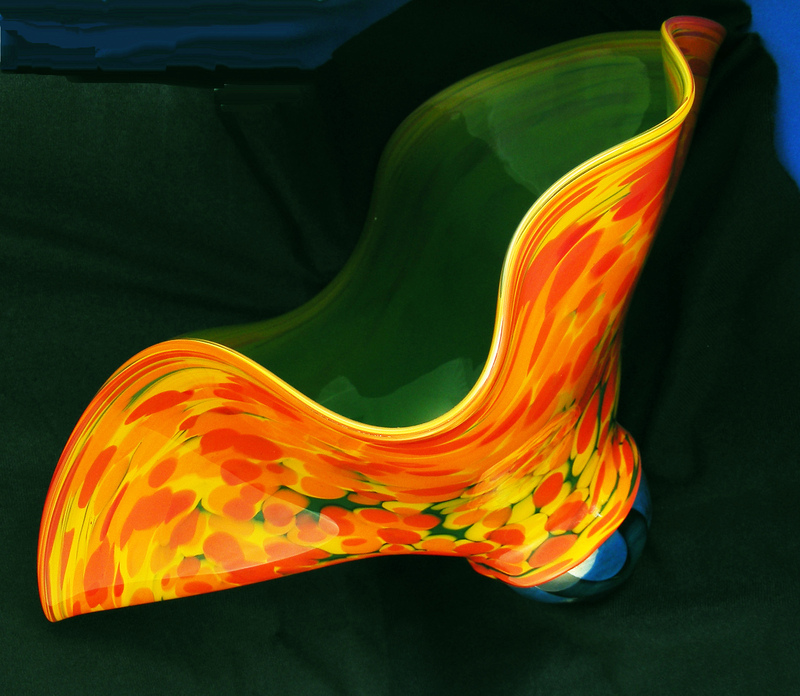 This entry was posted in Art and Design, Cool jobs and tagged corning, glass blower, glass blowing, how to blow glass, rene steinke, venetian glass by Megan Hess. Bookmark the permalink. I sat in on a glass blowing demonstration when I was in Venice! This is the coolest job ever.